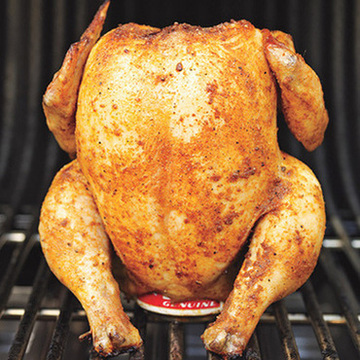 This is a really simple BBQ beer can chicken recipe, from little household in south suburban Britain. I hope you enjoy it. I couldn't believe my luck when I came across this beer can chicken recipe. It is so simple and so tasty so enjoy it and let me know how you get along with it. Find a small bowl and mix together the garlic, mustard and all of the spices and herbs. Mix them together really well and the set aside in the fridge for about 20 minutes. Then, get you spices and herbs mixture you made earlier and rub it all over the chicken, inside and out. Make sure you give it a good covering, especially on the inside! Using the picture above as a guide, open the can of beer and ram it into the chicken. Put on the BBQ on a low heat for about 1 and a half an hour.